I really should have plated this in a styrofoam plate or take-out container. Because that’s how I’ve always had it, usually at a local Hawaiian spot or at someone’s luau. It was a day like this that I was craving being back home in the islands. 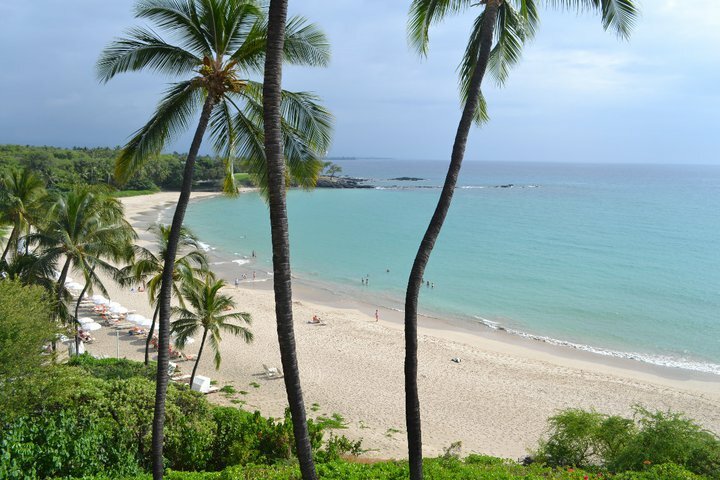 When Joe and I lived in Hawaii, we would always have our bathing suits in the back of the car for quick ocean dips. He would pick me up from work at about 5pm and the first thing we did was pull off to our facvorite beach, throw on our bathing suits behind the open car door and run into the warm Hawaiian waters. There is nothing like jumping into clean warm waters at sunset. It’s truly magical. Let me warn you, there is absolutely nothing healthy about this dish, but it’s just how it is. 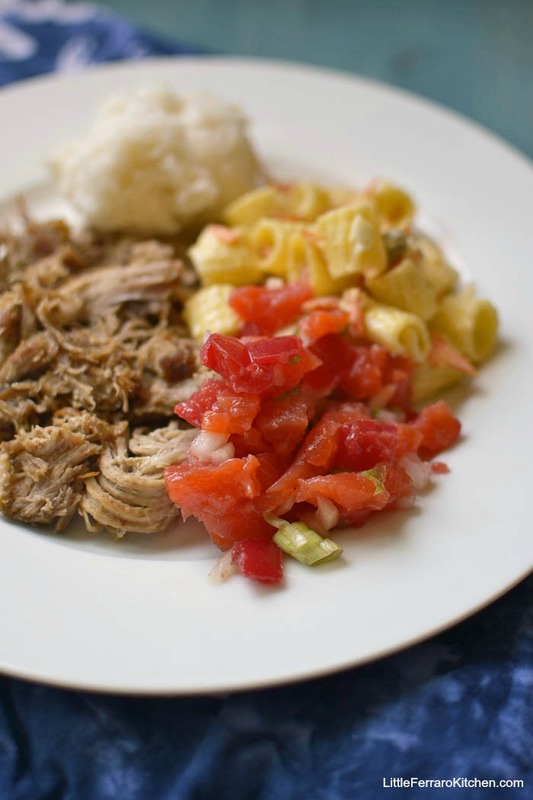 Basically a plate lunch (for those that didn’t grow up in Hawaii), is a simple plate of food with rice, macaroni salad and some protein, like kalua pork or shoyu chicken. And..it’s damn ono! 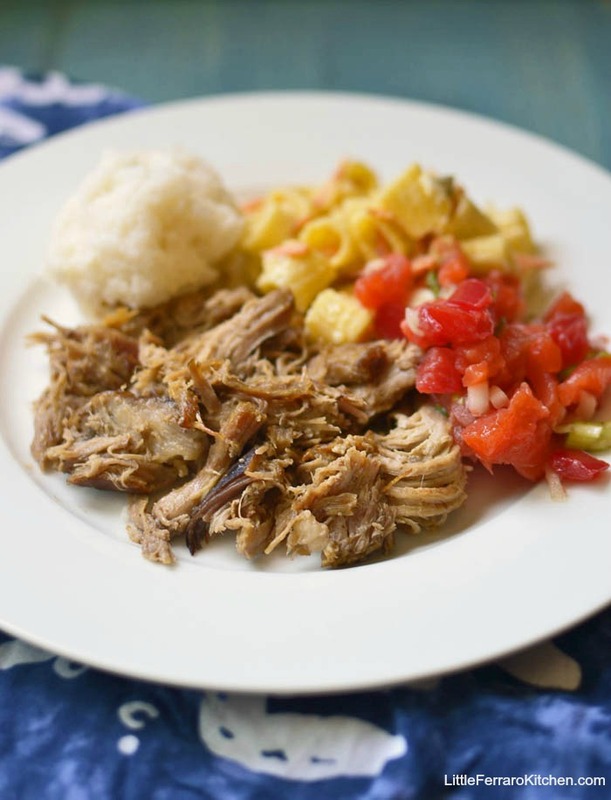 I got the kalua pork recipe from my friend Shanna at Pineapple and Coconut. 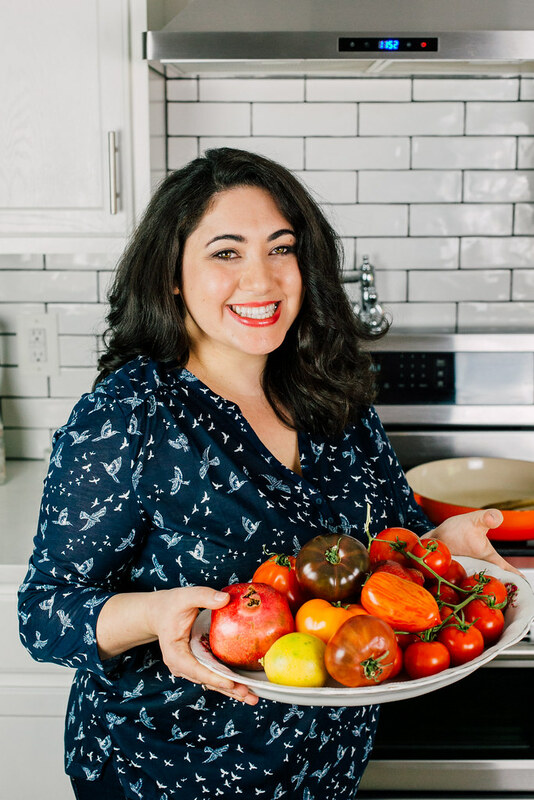 She also has a huge fascination with the Hawaiian culture and created a kalua pork recipe in the crockpot! 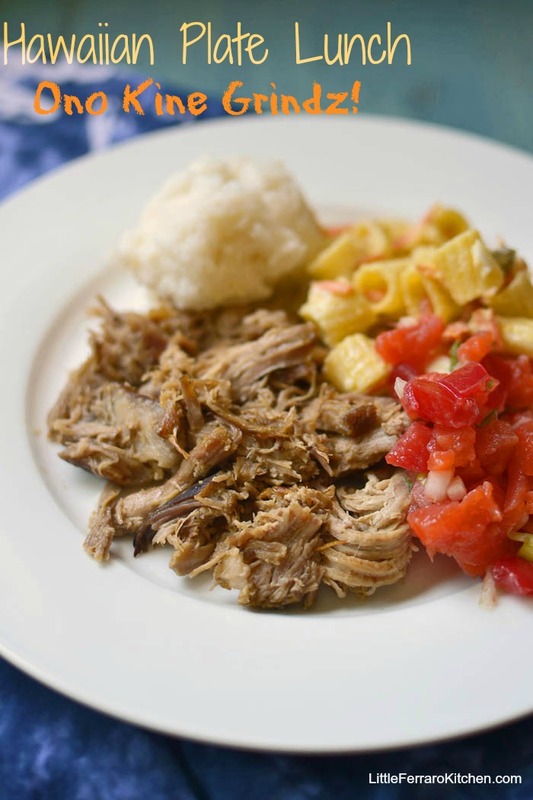 Traditionally, kalua pork is cooked in an imu (an underground oven). If you’ve ever been to a luau, you have probably seen it done the morning of the luau. It’s a beautiful ceremony of taking the whole pig and cooking it underground with hot rocks and banana leaves. The hot rocks heat the pig slowly for hours and hours and the pork is smokey and so incredibly tender! Shanna makes her pork in the crockpot with coarse, thick Hawaiian salt and cheats with a touch of liquid smoke. If you don’t have a chance to build a giant imu in your backyard, this recipe should do the trick. Joe made the mac salad and that’s what you call it. Not macaroni salad, but mac salad, as in “I like one plate lunch, 1 scoop rice wid mac salad”. Or you can get it without mac salad, as in “Hey brah, I like 1 kalua pork plate lunch wid 2 scoop rice”. This is how you order it back home. The secret with this amazing mac salad is…a lot of mayo and grated onion! Since Joe made it there was no real measurements (sorry), it’s an eyeball thing really but I’ll try my best and figure it out. 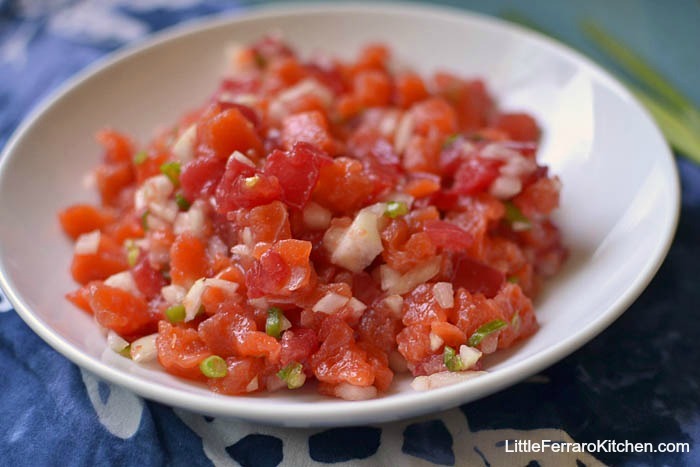 The next part is lomi lomi salmon, the salt-cured salmon salad with onions and tomatoes. Lomi lomi means “massage” which is what you’ll be doing to the salmon. I’ll show you how to make this salty salad. 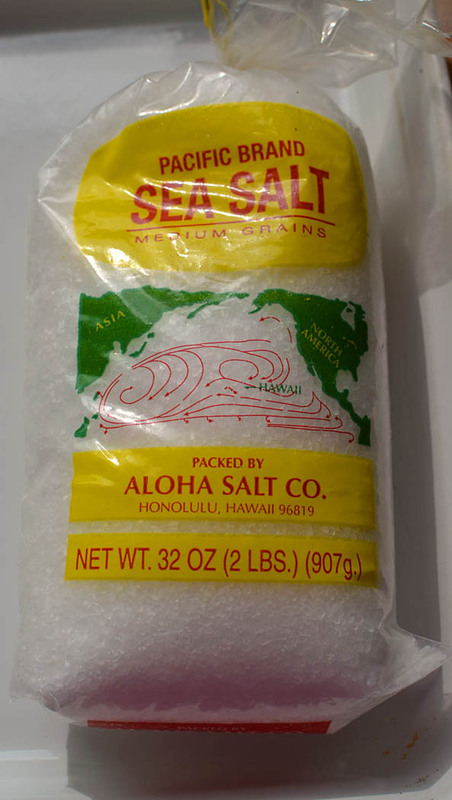 1) Lay a good layer of Hawaiian salt on the bottom of a wide baking dish. 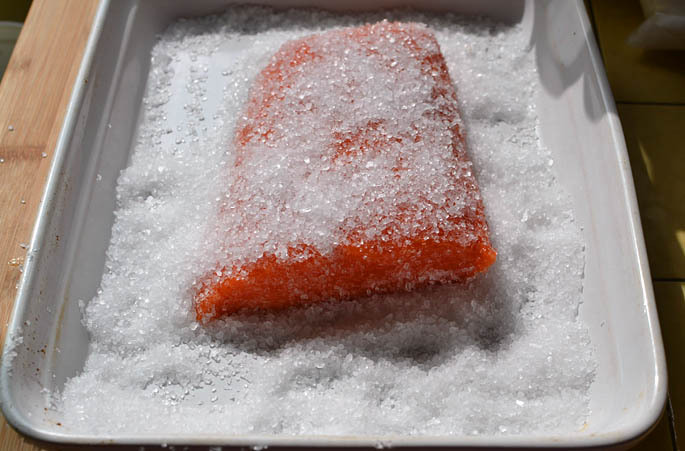 2) Rinse and pat fry your salmon, place it on top of the salt and cover it with more salt. Massage the salt into the salmon. 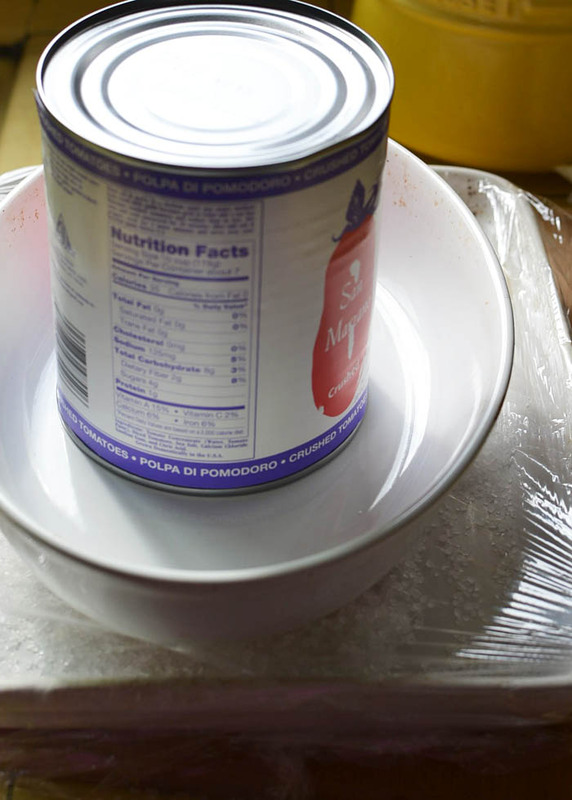 3) Cover it in plastic wrap and place another wide dish with a large weight to help weigh down the fish. Refrigerate for at least 24 hours. 4) By this time you can see the salt helped pull the moisture out of the fish. It’s totally safe and delicious to eat the fish now since the salt helped cure it. Next, rinse the salmon very well under cold water. (You may even want to rinse it several times because it can get very salty). 5) Remove skin from salmon and cut into small cubes. 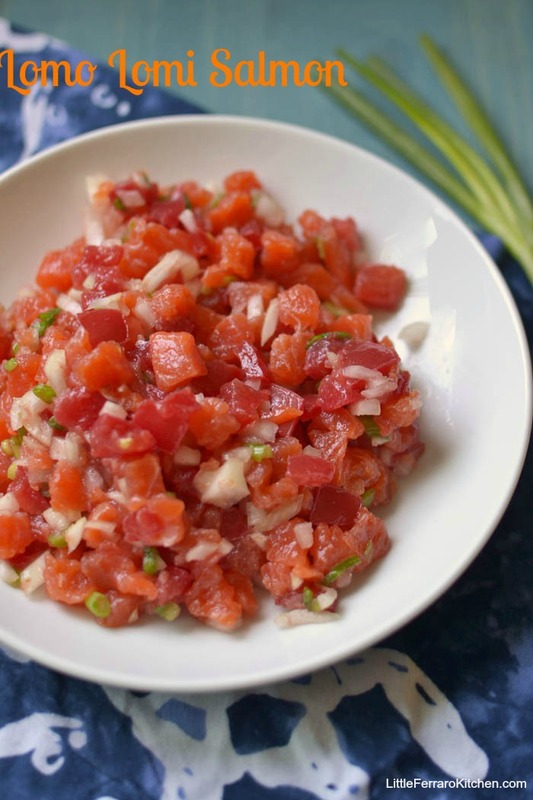 Add chopped tomatoes, onion and green onion. Toss well and refrigerate until ready to use. I hope you enjoyed my modest version of a Hawaiian plate lunch. There is nothing like the people of Hawaii and the Aloha spirit. I hope you all get to experience one of the most beautiful places in the world. Cook macaroni to package directions and rinse under cool water when done. In a large bowl, add the macaroni, mayo, onion, carrot and salt and pepper. Toss to combine and taste for seasoning. 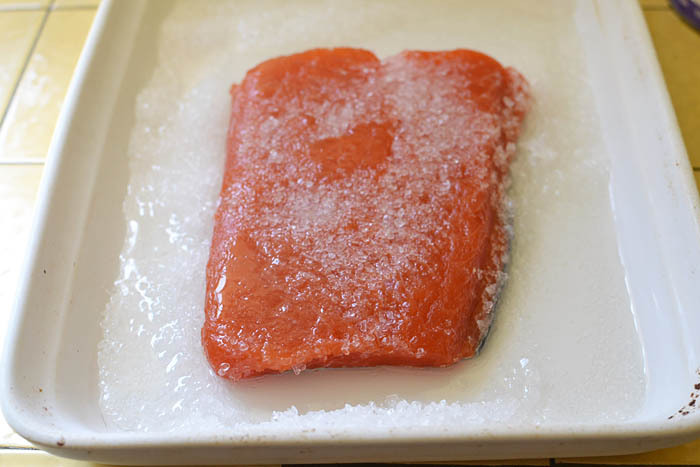 2) Rinse and pat fry your salmon, place it on top of the salt and cover it with more salt. 4) By this time you can see the salt helped pull the moisture out of the fish. It's totally safe and delicious to eat the fish now since the salt helped cure it. Next, rinse the salmon very well under cold water. (You may even want to rinse it several times because it can get very salty). Assemble plate with 1 or 2 schoop white rice, 1 scoop mac salad, lomi salmon and kalua pork. I remember getting Hawaiian plate lunches when I visited the islands back in the day. Gotta love the mac salad and pork and rice!